In his last week , from Tuesday 26 to Sunday, January 31 , the exhibition opens in the morning at 10am . Last admission to the exhibition space: 1 hour before closing. *Except on Monday, when the Philharmonie de Paris is closed. 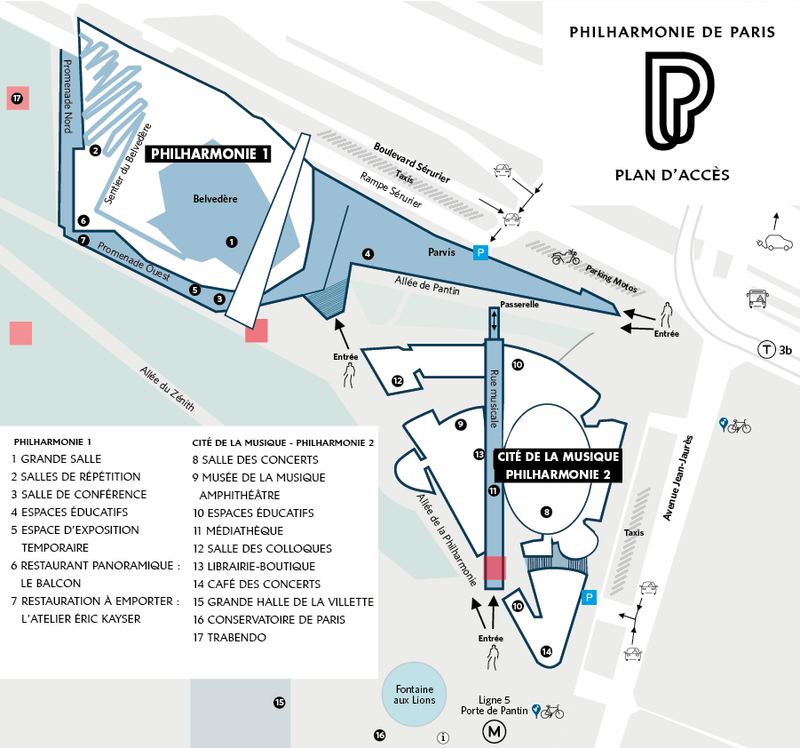 Philharmonie de Paris activities are divided between Philharmonie 1, the new building designed by Jean Nouvel, and the building that has housed the Cité de la musique for twenty years and renamed Cité de la musique – Philharmonie 2. From Paris: Take Avenue Jean-Jaurès to the Porte de Pantin roundabout. From the Paris ring road (périphérique): Take the Porte de Pantin exit. Direct access from the Paris ring road (Périphérique). From Avenue Jean-Jaurès, take Boulevard Sérurier towards Porte de la Villette. Parking 1 to open in January 2015. Access from Avenue Jean-Jaurès heading towards Paris. A café awaits you at the entrance to Philharmonie 1.Open daily from 10am to 8pm.Closed on 25 December, 1 January and 1 May. Your ticket for the Marc Chagall: The Triumph of Music exhibition gives you same-day free admission to the Museum of Music’s permanent collection, don’t miss it! Subscribe to our newsletter to stay informed of what’s happening at the Philharmonie de Paris.